NEM has announced the launch of two NEM Blockchain Hubs, one in Australia and the other in New Zealand, to serve as an education and knowledge hub for blockchain technology. Located at The Precinct in Brisbane’s Fortitude Valley and EPIC Westport at Westport respectively, the hubs will have a dedicated NEM representative responsible for sharing the basic foundations of blockchain and cryptocurrencies with the public and community members. They will also be supporting startups and larger enterprises who are looking at adopting blockchain for their business. This will be through regular activities, workshops, hackathons and forums held throughout the year. The NEM Blockchain Hub in Brisbane is hosted by TravelByBit, a NEM funded company that is on a mission to open up Australia to digital currency tourism. It has built a network of local tourism businesses across regional Australia, allowing travellers to pay for goods and services with digital currencies without the hassle of foreign exchange rates. “We have been part of the crypto and blockchain community in Australia for some time and the development of the NEM Blockchain Hub will be a positive step forward towards education and adoption in cryptocurrency.” said Caleb Yeoh, CEO of TravelbyBit and also board member of Blockchain Australia. In New Zealand, the hub at Westport is hosted by the CerebralFix Group, a gaming studio that works with Disney, DreamWorks and the BBC and had recently developed the ‘MatchNEM’ game. 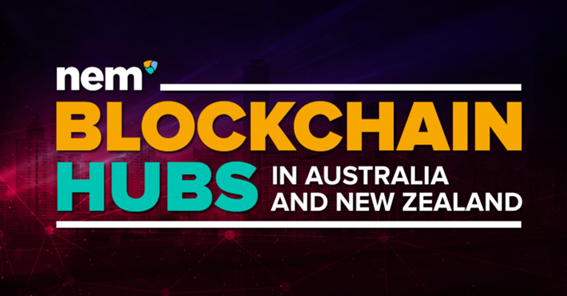 The hub in New Zealand will have a co-working space, regular education and engagement activities as well as an incubation platform for businesses leveraging the NEM blockchain. “The purpose of the NEM.io Foundation is to introduce, educate, and promote the use of the NEM blockchain technology platform on an international scale to industries and institutions. NEM ranks as one of the top blockchain technologies worldwide and we are excited that Westport which is just 45 minutes flight from Wellington, New Zealand’s capital city, is the location of choice to develop the hub.” said Benjamin Dellaca, Group Director for CerebralFix. The Foundation is hosting a launch event at EPIC Westport on Wednesday, 25 July and at The Precinct on Friday, 10th August. The Foundation has presence in over 100 cities in 47 countries, including Australia and New Zealand. Since the inception of the local operations in November 2017, the NEM Australia and New Zealand team, now made up of eight full time employees, have been focused on giving educational talks around the country — ‘NEM 101’ — and developing partnerships with academia and businesses interested in blockchain technology.